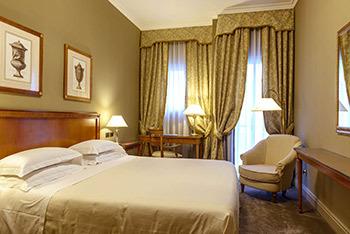 Nestled in the heart of Bari, Palace Hotel has been the reference point of the city’s hospitality since 1956. It is a charming and exclusive hotel where every stay is an unforgettable experience. Since 1956 the Palace Hotel has welcomed many from the world of politics and entertainment – today it remains the favourite among cultural, entertainment, music, national and international business names. It is in the city centre, just a few steps from the Basilica of Saint Nicola, the Cathedral of Saint Sabino, the Swabian Castle, and the Old City; a few minutes on foot from the Petruzzelli Theatre and the train station; it is the ideal point from which to reach the main attractions of Apulia’s capital and beyond. The Hotel’s 200 rooms, including 18 suites, are furnished with exquisite taste and attention to detail and offer every comfort. The Congress Centre has 16 conference rooms – many naturally lit – with air conditioning, high-speed wi-fi coverage, seating up to 1500 people. The indoor garage with space for 50 cars completes the offer. Details: Palace Hotel Bari http://www.palacehotelbari.com/en/ ; Via F. Lombardi 13, 70122 Bari, Italy. Special packages for conference attendees will be offered shortly and can be booked via the conference website or directly with the hotel. The Palace Hotel is Bari’s largest and most prestigious, set in the heart of the city, two steps from the historical centre, form the shopping streets, and from the commercial and cultural activities. The hotel is 12 km from the Karol Wojtyla International Airport and a 10 minutes’ walk from the city’s main train station. There are numerous connections with Bari’s central station (North Bari Railroads, http://www.ferrovienordbarese.it/home ) from 5.29 am to 11.40 pm. The “Tempesta” shuttle guarantees trips every hour lasting about 30′ each, from 5.35 am to midnight (http://www.autoservizitempesta.it/en/index.php). One gets off at the nearest stop in via Niccolò Piccinni and after a one minute walk reaches the hotel. From the airport’s passenger terminal to the city centre (Piazza Moro): during the return trip the bus stops in Viale Europa, via B. Buozzi, via F. Crispi, via N. Piccinni (near Bari’s Palace Hotel), via Q. Sella, and Corso Italia. From Piazza Moro to the airport’s passenger terminal: the stops are in via A. da Bari, via N. Piccinni (near Bari’s Palace Hotel), Piazza Garibaldi, via F. Crispi, via B. Buozzi, viale Europa, and via d’Annunzio. The service begins at 5 am and runs until around 9.30 pm. The trip lasts between 30 and 45 minutes. There are many car rental agencies at the airport’s Arrivals terminal. The 16, 53, 13, 3, 14, 2, and 6 lines all stop near the hotel. Go north towards Piazza Aldo Moro and continue on via Sparano da Bari for 750 m. Turn left on Corso Vittorio Emanuele II and continue for 350 m until the intersection with via F. Lombardi. Turn right and continue until number 13, the hotel is on your right. Registered participants of the symposium enjoy discounted hotel rates at the Palace Hotel Bari. To make your hotel room reservation, please download the Hotel Room Reservation Form and send the completed form by FAX +39 080 5211499 or EMAIL info@palacehotelbari.it . Some 70 rooms are guaranteed until 30 November 2016.